Hi everyone, today I wanted to talk a little about the "Right Brain Business Plan" which is a fabulous resource to all of you "right brainers" out there who are looking to start a business or are having a little challenge writing a business plan. Some of us "Creative types" avoid writing a formal business plan as the idea of huge word documents, boring excel spreadsheet and dare I say working out the money (Moola as the book refers to it as) scares us! This book turns all of this around and using your right brain creative thinking style to work on creating a visual map for success. 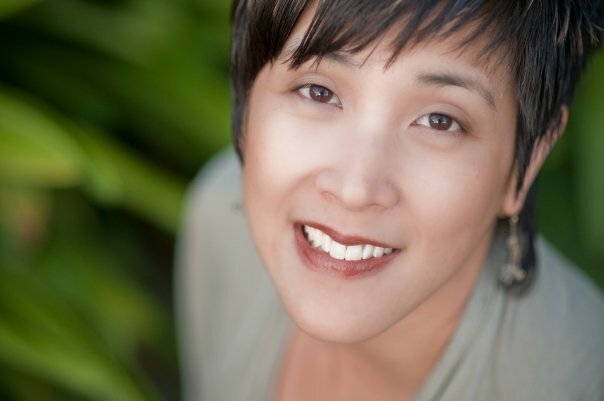 It will feed your creative side by taking you through each aspect of writing a plan for your business using vision boarding techniques, pictures, words and photos. There are lots of great worksheets to download full of color and fun and the book even makes spreadsheets exciting with the use of color and simple financial planning techniques. 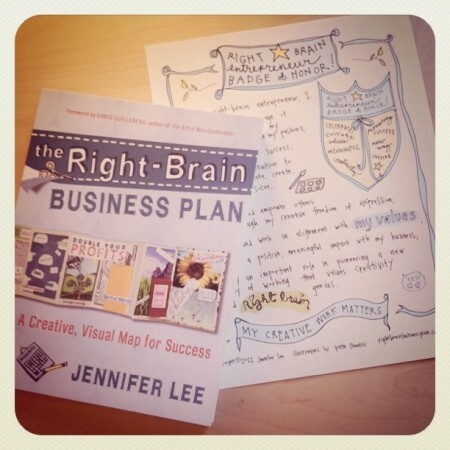 Jennifer Lee - Author of "The Right Brain Business Plan"
I had the opportunity to interview Jennifer Lee, the author a few months ago, so wanted to share a few of her insights about the book. 1) Jenn, huge congratulations on the publication of your book. Can you tell us a little about the book and who would benefit from it? Thanks, Louise. The Right-Brain Business Plan guides you through a fun, visual, and accessible process for completing all the standard sections of a business plan. The book includes colorful, illustrated play sheets, creative exercises, full-color photos of featured Right-Brain Business Plans, and success stories of fellow right-brain entrepreneurs. The book is for budding and seasoned business owners including artists, crafters, writers, photographers, coaches, consultants, therapists, yoga teachers, massage therapists, holistic health counselors, non-profit leaders, educators, and any creative soul wanting to turn their passion into profit. 2) How long would you say it took from the time you had the idea to publication? 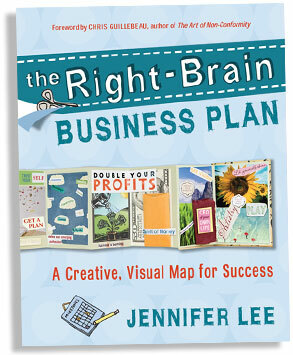 I made my first Right-Brain Business Plan in November 2007 at my kitchen table during Art Every Day Month. I had no idea then that this idea it would turn into a book! I created my 9-page handwritten and illustrated e-book in the spring of 2008. And in 2009 I set out to write a book (a totally different one! ), but publishers were more interested in The Right-Brain Business Plan concept so I sent out proposals for that and landed my book deal with New World Library in the fall of 2009. My manuscript was due to my publisher in April 2010 and then it went into production and was published in February 2011. So, long story short, it took a little more than three years to go from initial idea to book on bookshelf. 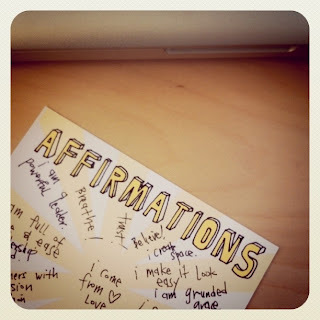 3) What right brain tools did you use to develop your ideas and the plan for the book? I used many of the right-brain tools that I talk about in the book! I used a Levenger Circa notebook to organize all of my existing material by chapter before I even started writing. That made it easier to know I wasn’t starting from scratch and it already started to “feel” like a book. I used mind-maps and sticky notes to brainstorm and outline content for chapters. I also used my sticky note project plan to map out my tasks and milestones throughout the publishing process. 4) What do you think are the biggest challenges for right brainers in business? And how to overcome them? One that I see is that many right-brainers in business can overlook the financial aspects of business. I encourage people to acknowledge that the numbers can actually be a pretty creative process. You can use your imagination to come up with new, innovative income streams. And you can always get support from an expert to help you figure out the nitty gritty calculations to make sure you’re going to turn a profit. I’d say the other is not trusting themselves enough. They tend to keep thinking they need more information or training, when really they just need to take some action, find clients, and make offers. 5) What is your favorite right brain booster and left brain chill pill? It’s hard to pick one, but a favorite right-brain booster is to gain a fresh perspective using images. 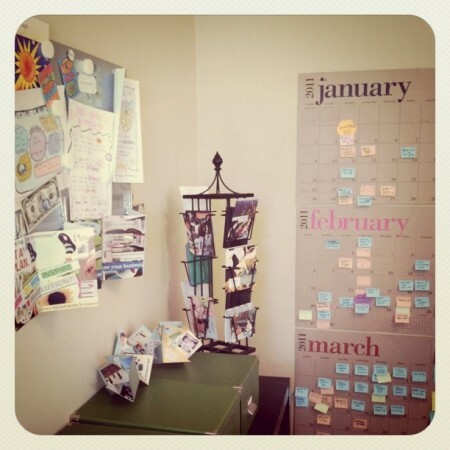 I also have my collaged values cards on an easel on my desk and that helps me focus my energy for the week. My favorite left-brain chill pill is to acknowledge my accomplishments when I’m beating myself about all the things I haven’t finished yet.